The team sheet to start the match had multiple changes with Will Hooley suffering a minor leg injury late in the week. He should be fit for selection against Ireland this next week. Will Magie slotted directly into the starting fly-half role going steady for eighty minutes. The shift on the bench with Gannon Moore moving from the number 23 to the number 22 shirt and Tim Maupin activated from the traveling reserves to wear the number 23 shirt. Overall, when you look at this match on the back end from film analysis the coaches and the players will know there were missed opportunities left on the field. But this match is the kind of match we've always lost in. We were far away in a foreign country in adverse weather conditions and a squad dealing with multiple injuries, previously this is the game we lose. However, that was not the case today, in an ugly game the Eagles soared, learning to win when you play ugly is a knack that only the best in world can do. After pushing the ball down the pitch Scrum-Half Ruben De Haas picked the ball out of the ruck scoring with a kick carry at the '11 minute mark. Romanian Fullback Ionel Melinte responded at the '15 mark. You could see with the ball placement of the Eagles box kicks the intent of Gary Gold's game plan. With some contentious game play back and forth, Outside Center Bryce Campbell scored his first try of the match off a deep box kick from De Haas and chased down by his midfield partner Inside Center Paul Lasike. Defense holding tight they forced the Eagles to retire at the half only up leading by seven. Mid-way through the third quarter left winger Ryan Matyas scored a try by collecting a cross kick turning the burners on to beat the Romanian defender. Fly-Half Will Magie made his conversion attempt extending the Eagles lead to 14 (5-19) at '47 mark. Continuously pushing the ball down the pitch the Eagles missed some opportunities to score against the Oaks with handling errors. Romania kept pushing the tempo getting deep into Eagles territory thinking they scored a try only to be called back upon TMO review as the player was offsides when he collected the ball for his scamper. Eagles defense would continue to hold, the inexperience of Romania creeping in as most of the third quarter would tick by. Reserve wing Tim Maupin would set the final scoreline by chasing down a kick from Magie to the corner for a try. Magie made his third conversion for the day setting the line at 31-5 in favor of the United States. 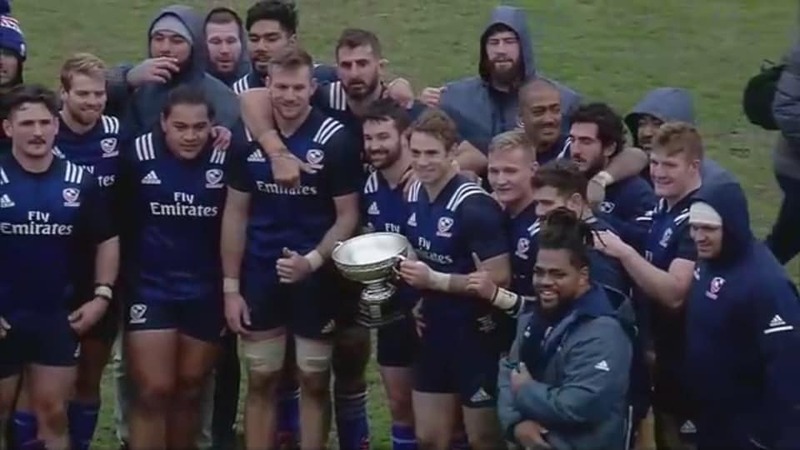 The Eagles take back the Pershing Cup from the Mighty Oaks of Romania. With a only an 8-point margin of victory for the Lelos over Samoa and Italy losing to Australia, the Eagles ascend from 15th to 13th in the World Rankings.